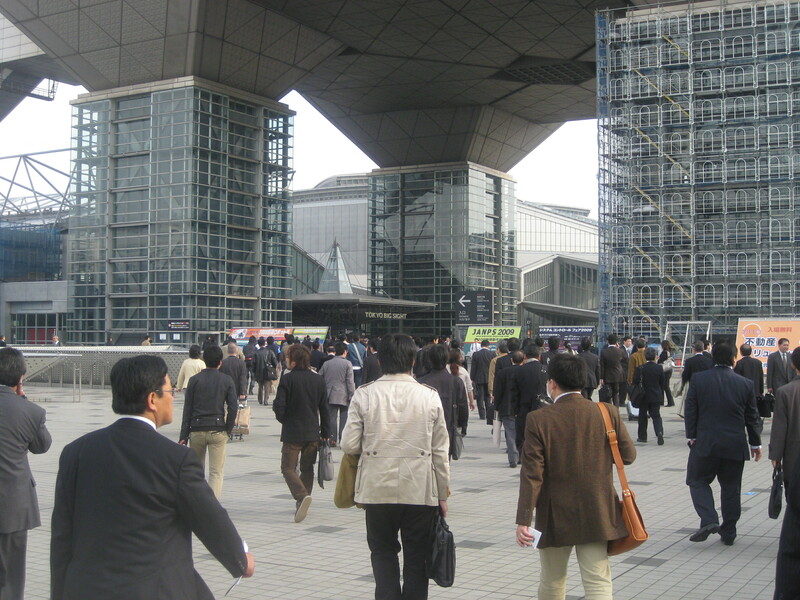 Joseph Mallozzi's Weblog: November 28, 2009: Tokyo Travel Day #4 – Dai San Harumi, Tokyo Big Sight, Les Creations de Narisawa! Now With 60% More Robots! 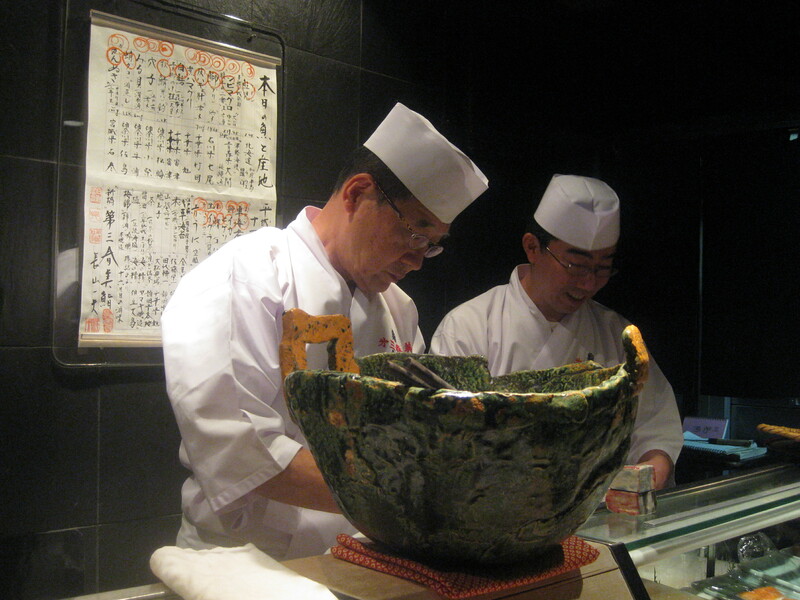 November 28, 2009: Tokyo Travel Day #4 – Dai San Harumi, Tokyo Big Sight, Les Creations de Narisawa! Now With 60% More Robots! Okay, I’ve got a lot of ground to cover so let’s get right into it. 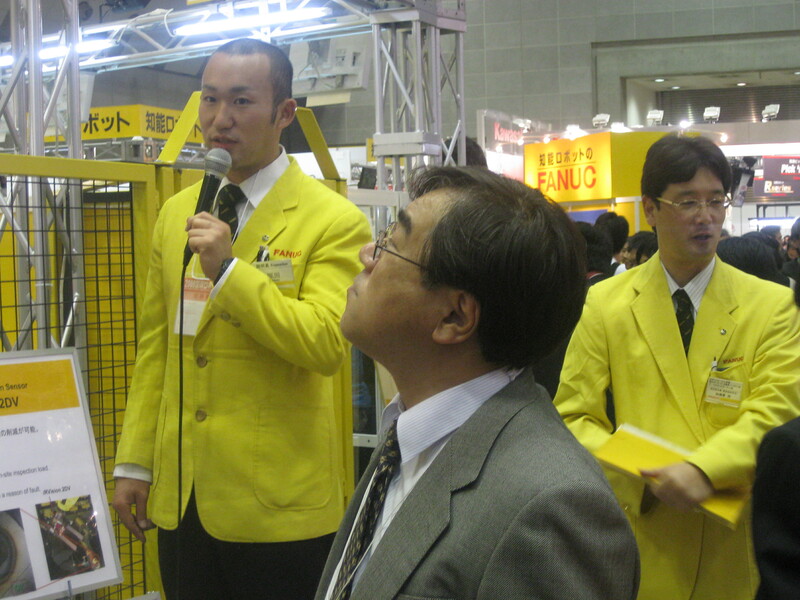 First off, the mystery of Ginza line-ups solved. Every year I come down to Ginza, I see these enormous line-ups. I assumed they were people waiting for show tickets - theater, as most of the liner-uppers tended to be older - but it turns out I assumed incorrectly. 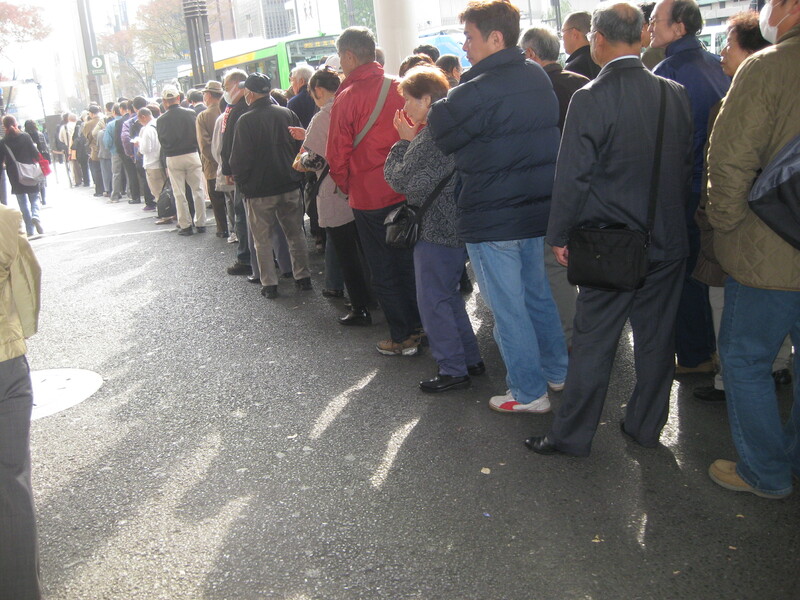 According to my friend Keiko, they're all lining up to buy lottery tickets. A draw is held every year with the grand prize in the tens of millions of dollars. And, apparently, they're all lining up outside their particular Ginza kiosk because it is purported to be lucky given that many of the previous winners purchased their winning tickets here.Hmmmm. Something to think about to help defray the cost of this trip.I met up with Keiko outside Pierre Marcolini, and then we strolled down to Shinbashi for our lunch at Dai San Harumi.They open at 11:30 p.m. We wer early and went for a walk. Not all that much to see in the area. It's a small but comfortable place. We were warmly greeted and took our seats at the bar. 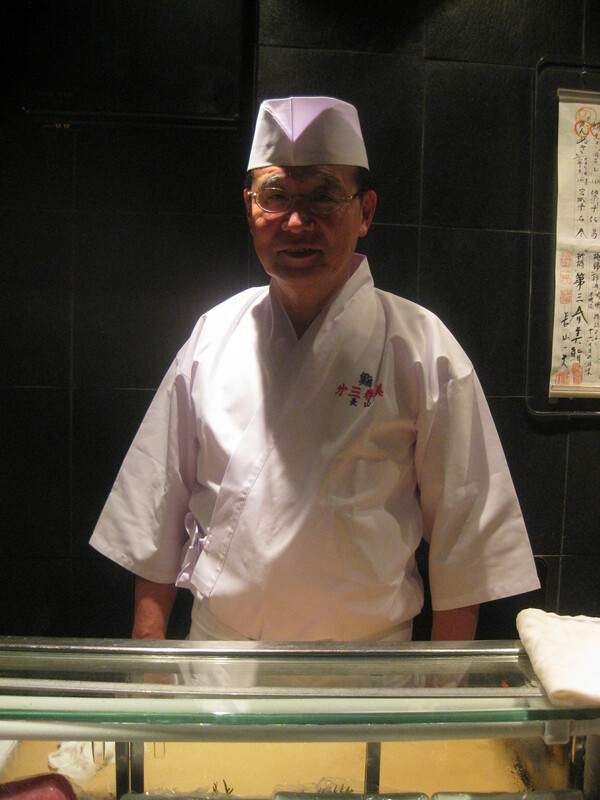 We settled in at which point Chef Kazuo Nagayama made his grand entrance. 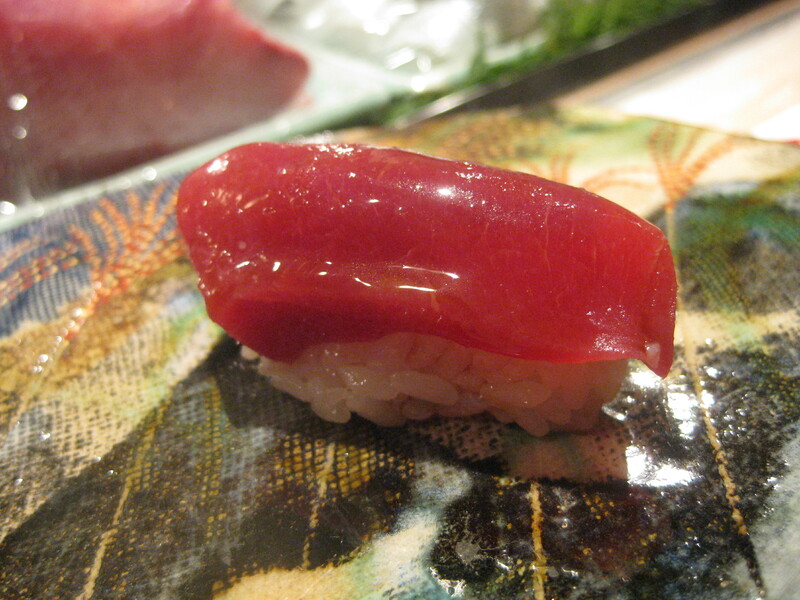 I’ll tip the review by telling you that while the sushi was fantastic, Chef Nagayama was even more fantastic, smiling and chatting away despite my toddler-level Japanese. 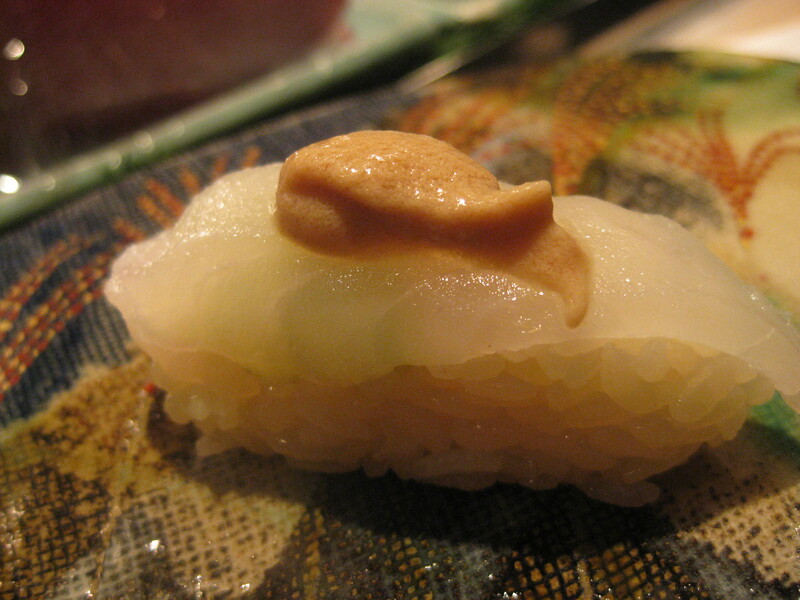 Ika. Squid. Surprisingly tender. The best I've ever had. 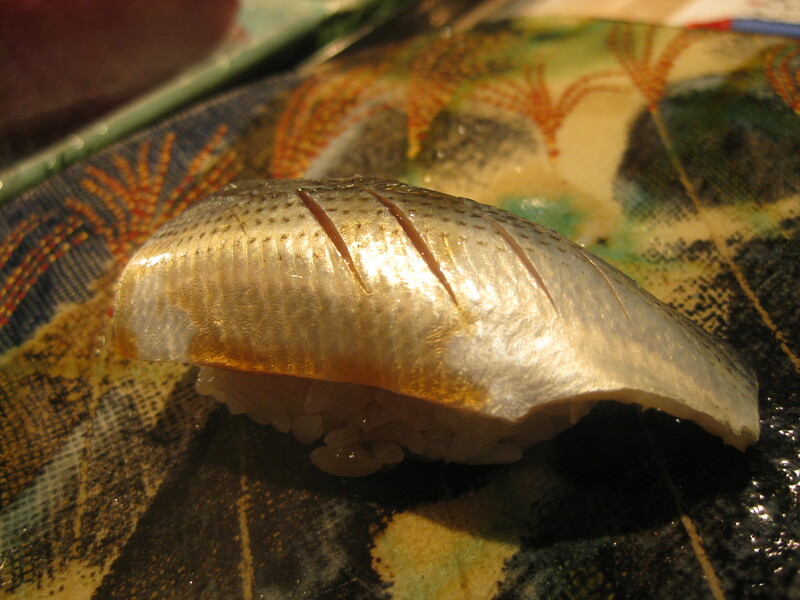 Alas, I'm not sure what the fish is, but it was topped with a dab of liver paste. Out of this world. 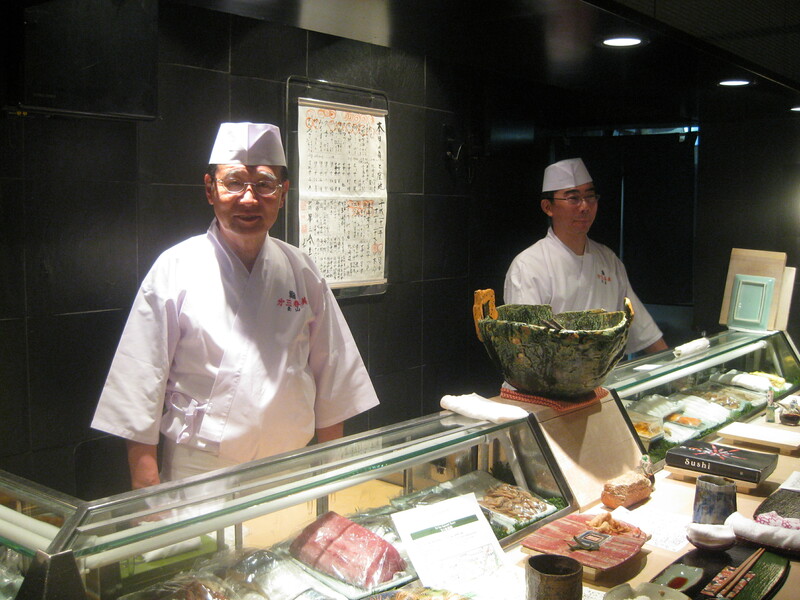 If I could eat only one thing in Tokyo, it wouldn't be the Kobe beef. It would be the tuna. 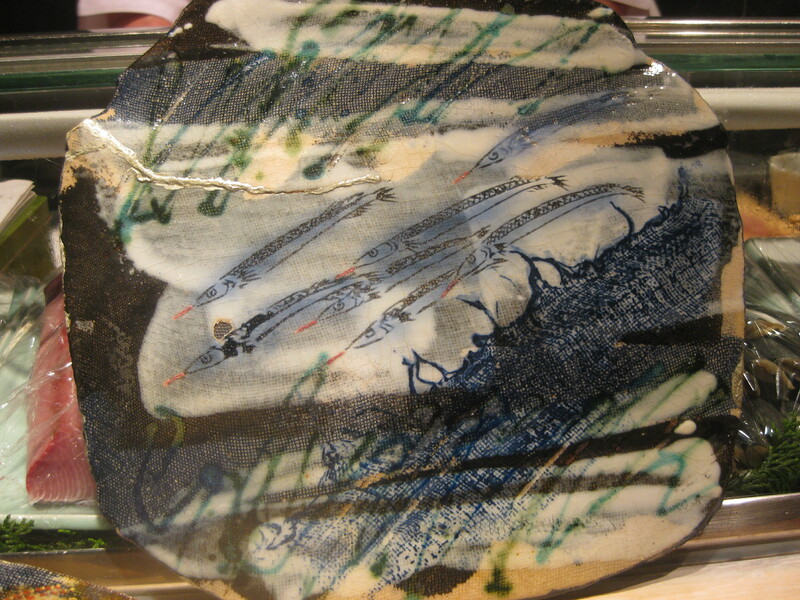 Chef Nagayama is not only an artist in the kitchen. 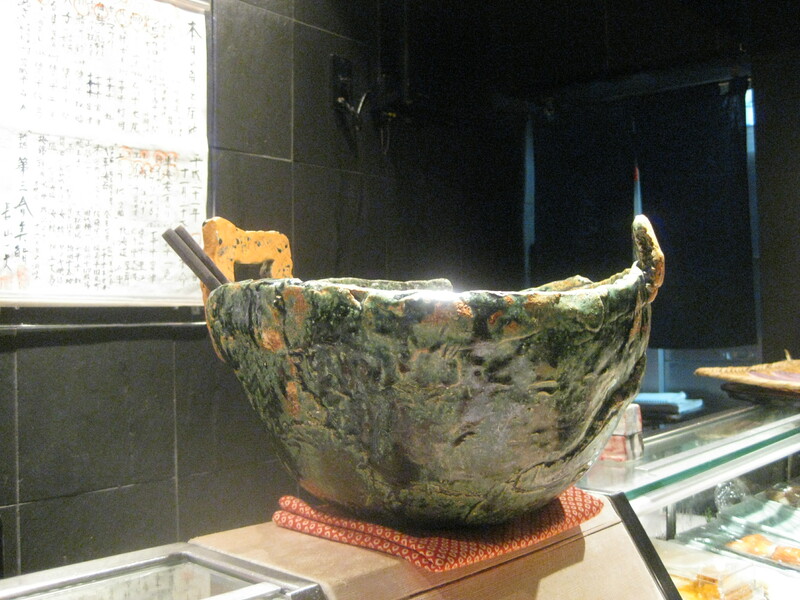 The restaurant is decorated with his beautiful creations. 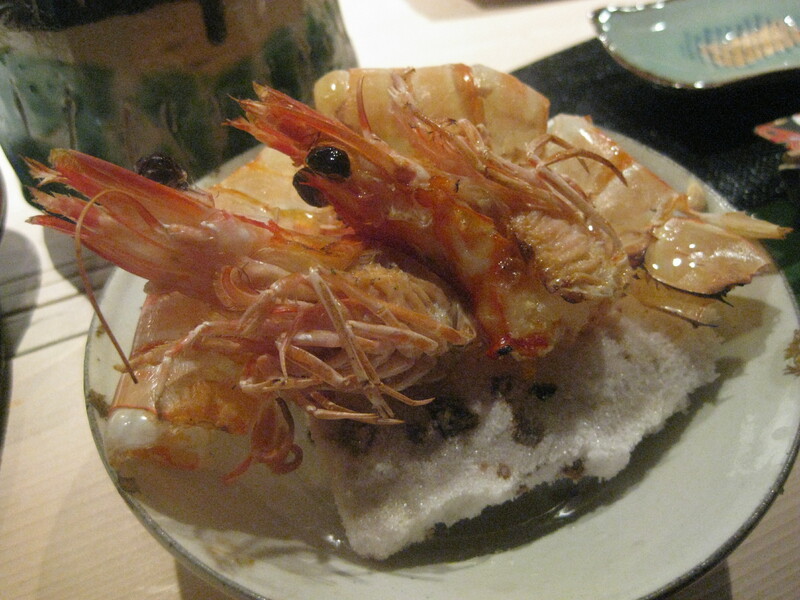 The prawn head and shells were flash-fried and served. 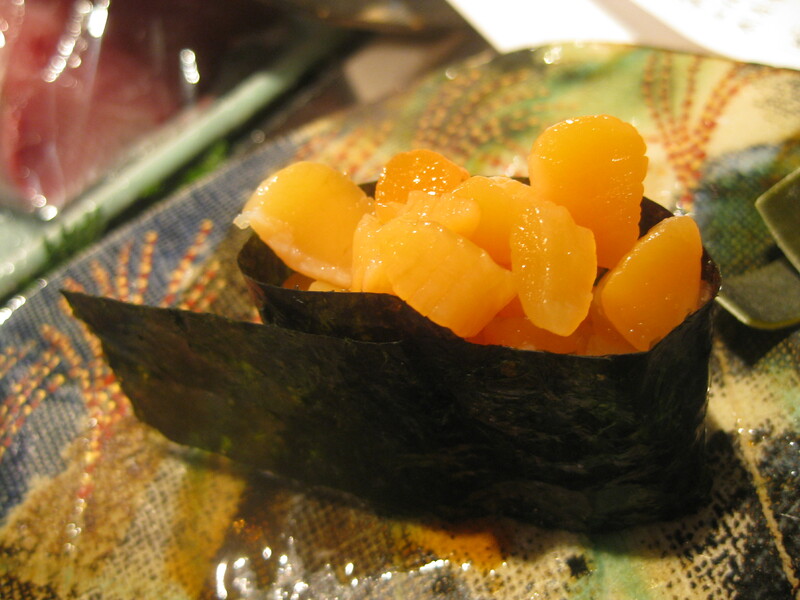 They possessed a chip-like consistency and proved very tasty. 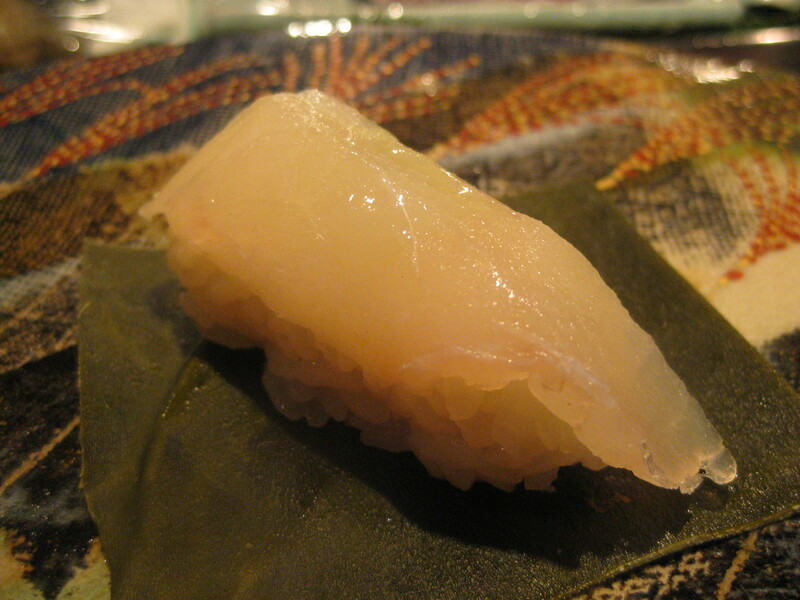 Throughout our lunch, Chef Nagayama chatted away with us, demonstrating a delightfully dry wit. 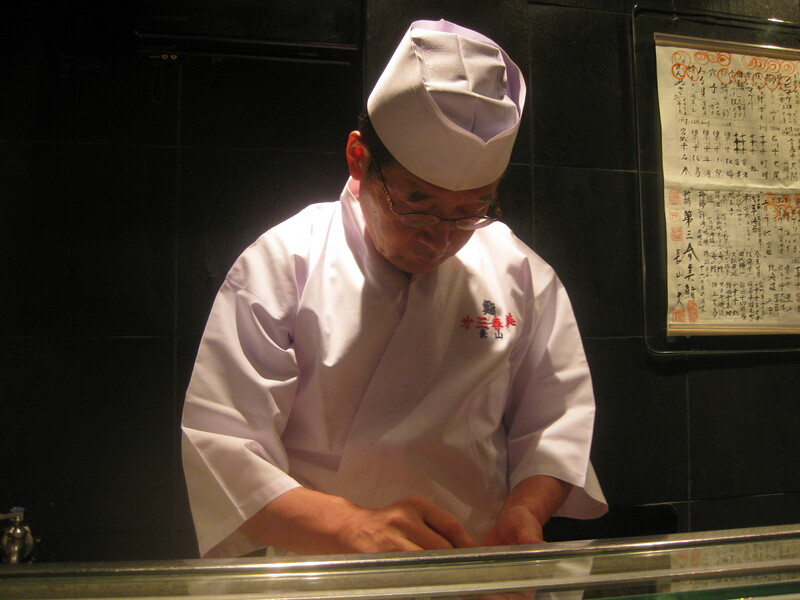 In addition to being a master sushi chef and artist, Chef Nagayama is also an author with several books under his belt. We ended up discussing the challenges of the writing field. 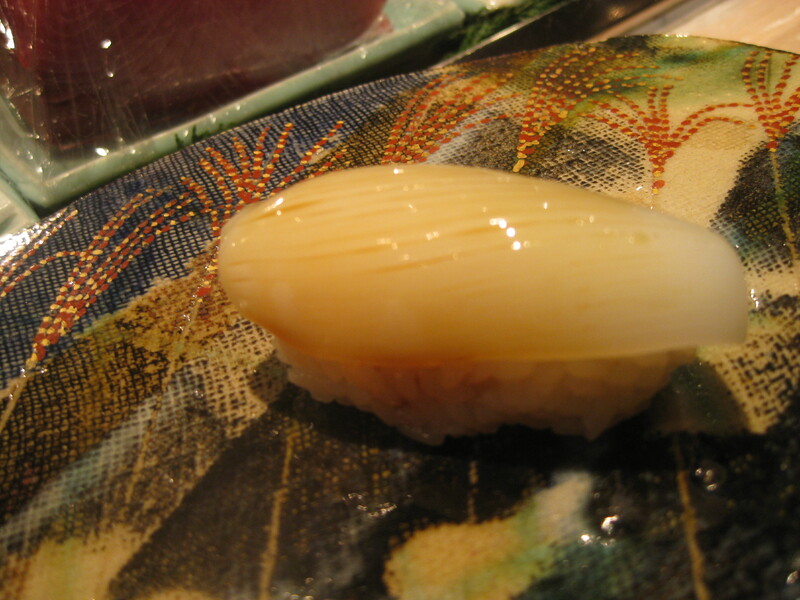 The quality of the sushi and the execution of the various nigiri would be enough to make me want to come back, but Dai San Harumi’s affable host assures that return visit. 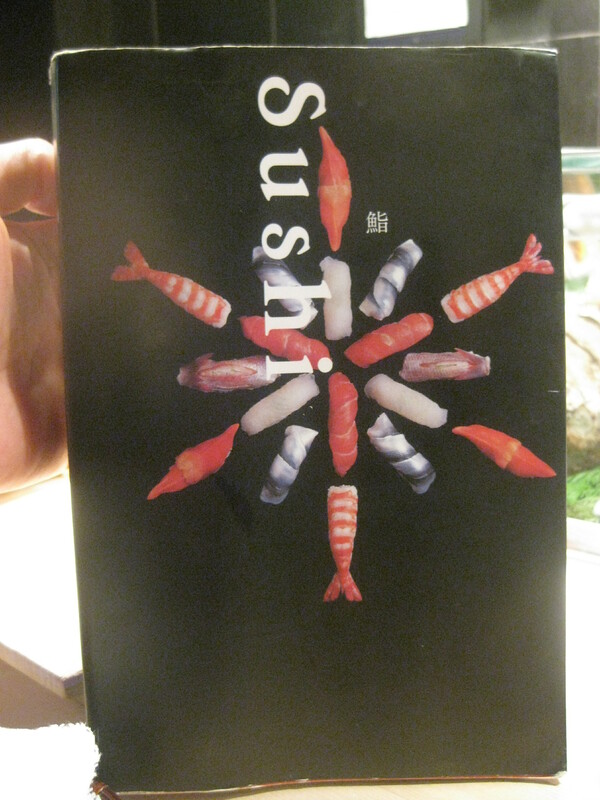 For those of you visiting Tokyo for the first time who may be a little nervous about venturing out to your first sushi meal, do yourself a HUGE favor and visit this place. 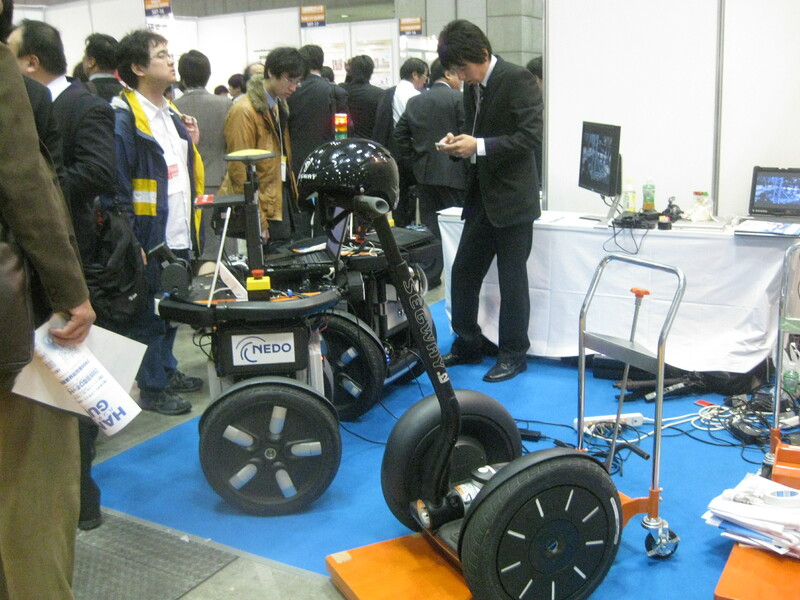 From there, we grabbed the subway (monorail) to Tokyo Big Sight where, I’d heard, a robot exhibition was taking place. Well, it was either the robot exhibition or the nail expo. I wasn’t quite sure of the dates. I tried to use my newly-purchased subway pass but it was rejected so I had to go to the special ticket booth to find out what was up. Apparently, according to the system, I'd taken the subway at Roppogni the other day and never left the station. It would seem that I swiped my card going in, but failed to swipe it leaving. Seriously. Why the need to let them know you've left? Had I not turned up to use my card after two days, would they have organized a search party? 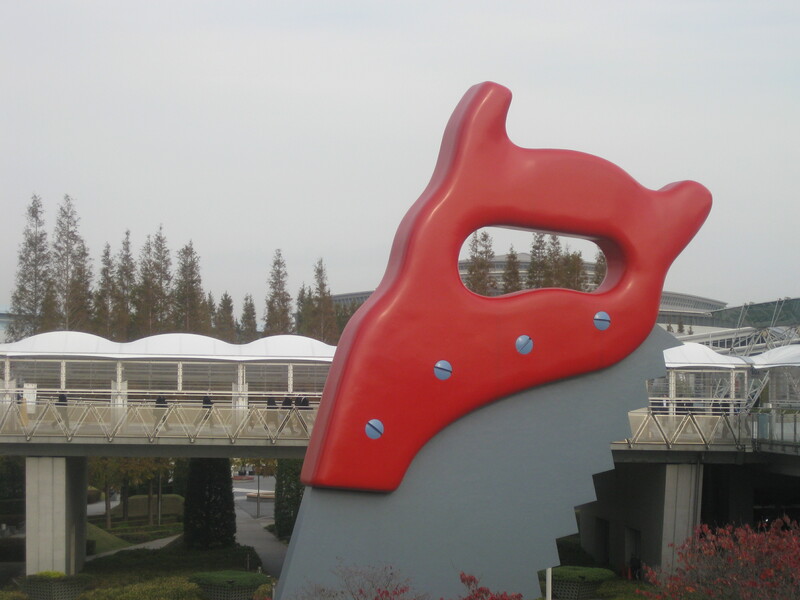 The big saw outside Tokyo Big Sight. Yeah, I don't know either. Keiko noted that approximately 99% of the attendess were male. These yellow jackets were a highlight for me. I think I’d call this one “chotto creepy”. This guy was part of some sort of assembly line set up. 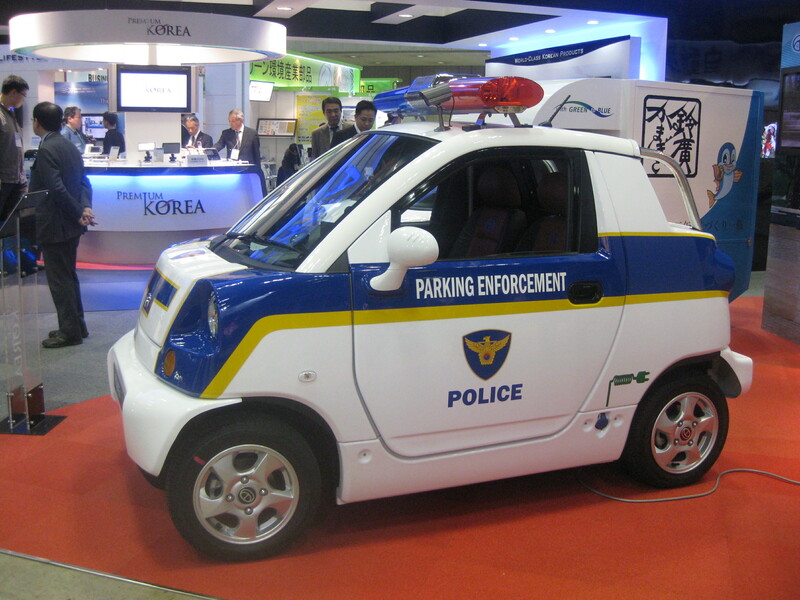 Alas, I would've loved to see someone take this baby on a test run. Clearly they've yet to design this guy a robot girlfriend. But he's hopeful! This guy (above) was looking for takers. Sadly, no one stepped up. From what I hear, he’s got a killer backswing. 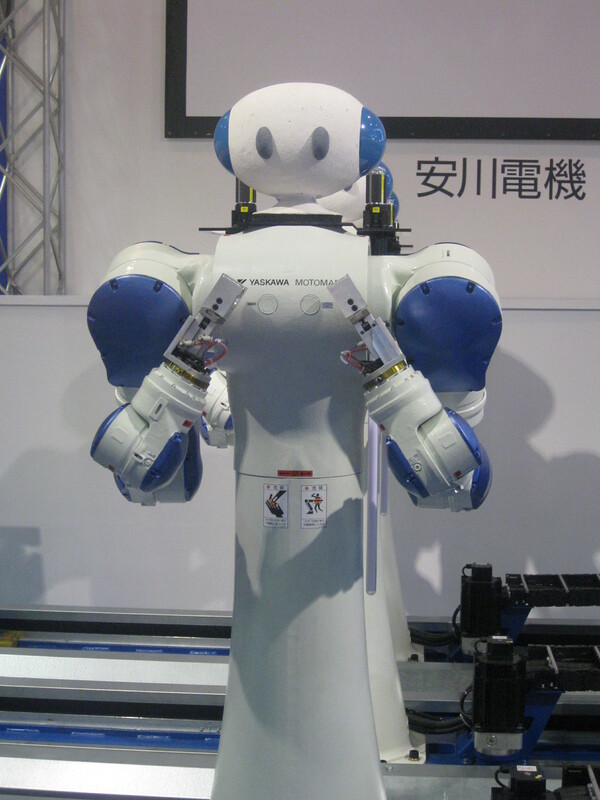 Now this guy (above) is my type of robot! The dancing dogs! Love how the guy on the very left eventually gets fed up, decides “Screw this!” and just gives up. Boy, the blue dog really gets into it! From the robot exhibition, it was over to Laduree for some sweets. In this case, the numbers were reversed. Although the place was packed, I was one of the few males in the place. I was told that in Japan, women prefer desserts the macarons and pastries while guys prefer chocolate. I guess I’m getting in touch with my feminine side. From the reception area we are escorted through an enormous sliding door to the dining room beyond. It struck me as very James Bond – sleek glass, metal, and dark wood, the all-male wait staff decked out in dark suits and sporting ear buds they used to communicate with the kitchen. 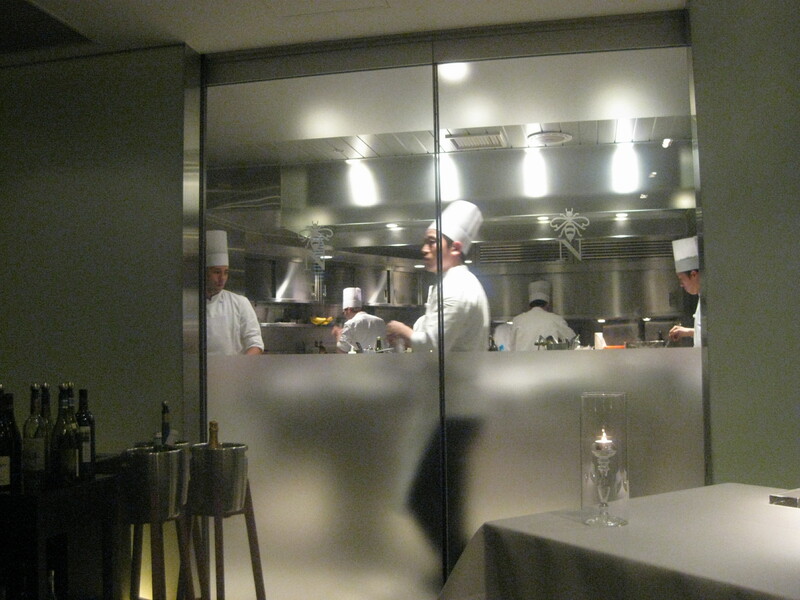 A large window allows diners a peek at the goings-on inside the cooking area. 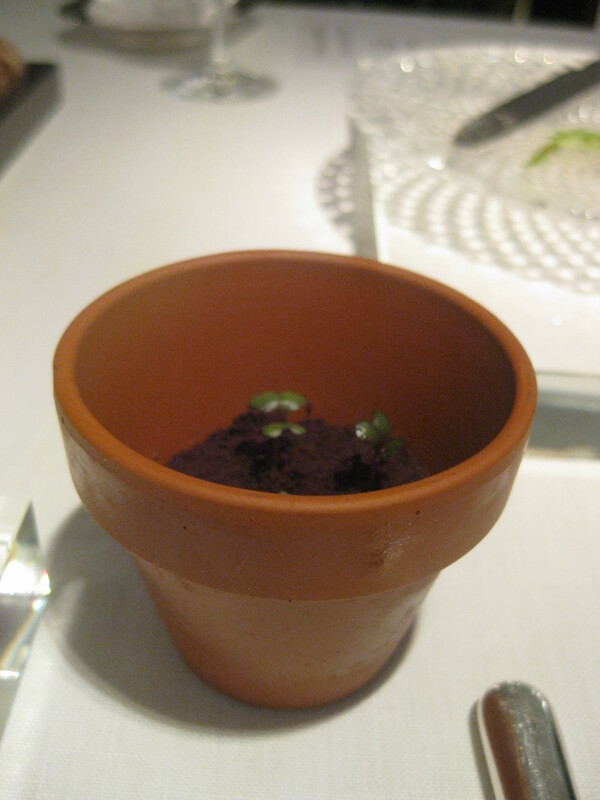 We received what appeared to be a soil-filled flower pot to go with our homemade bread. 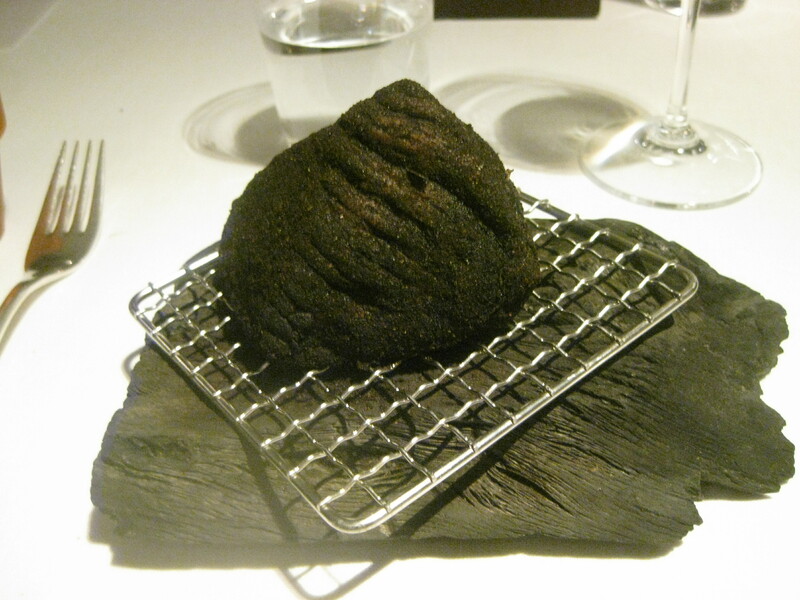 As it turned out, the earth was actually black olives, a layer of which concealed the butter buried beneath. 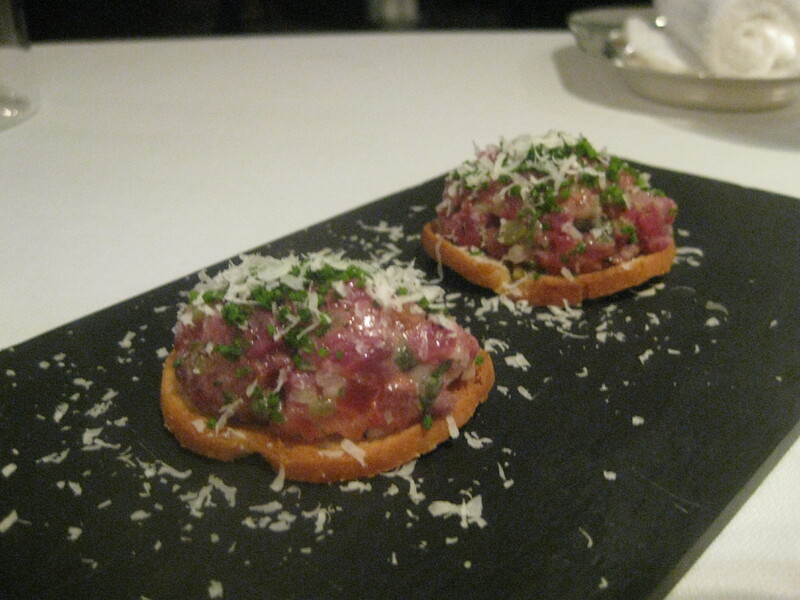 Holy-smokes-this-is-good home made mozarella with fawn tartar. 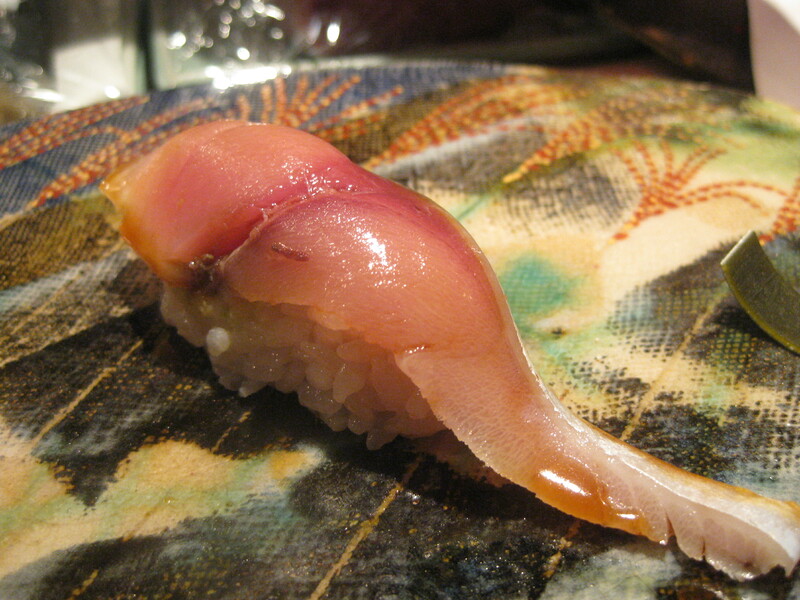 Eiko, my dining companion, loved the squid so much that she couldn’t stop talking about it. The kitchen team at work. 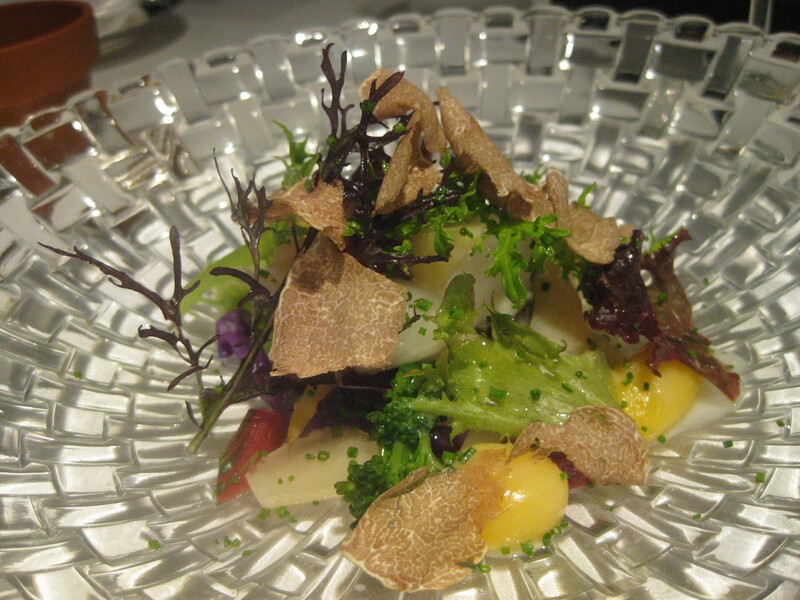 Organic vegetables and gnocchi with shaved truffle. I've never had veggies so tasty. 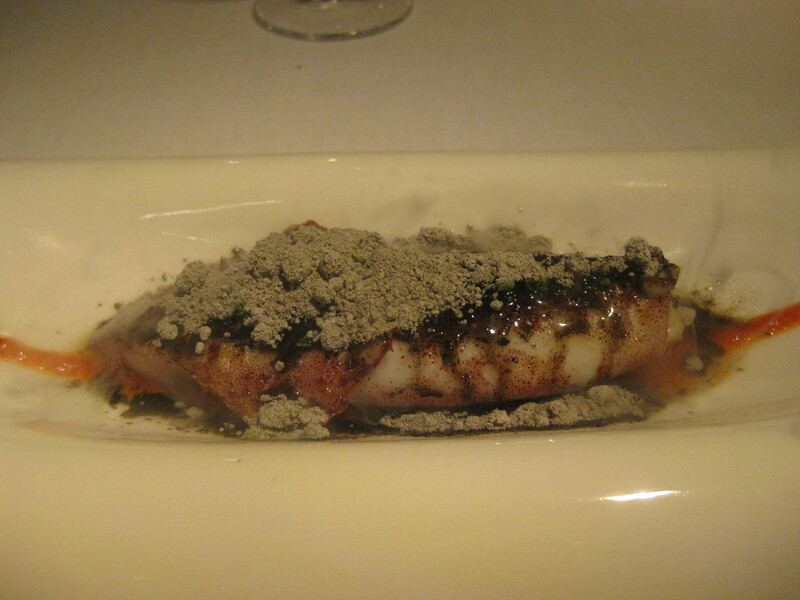 One of the sweetest-tasting langoustines I've ever enjoyed. 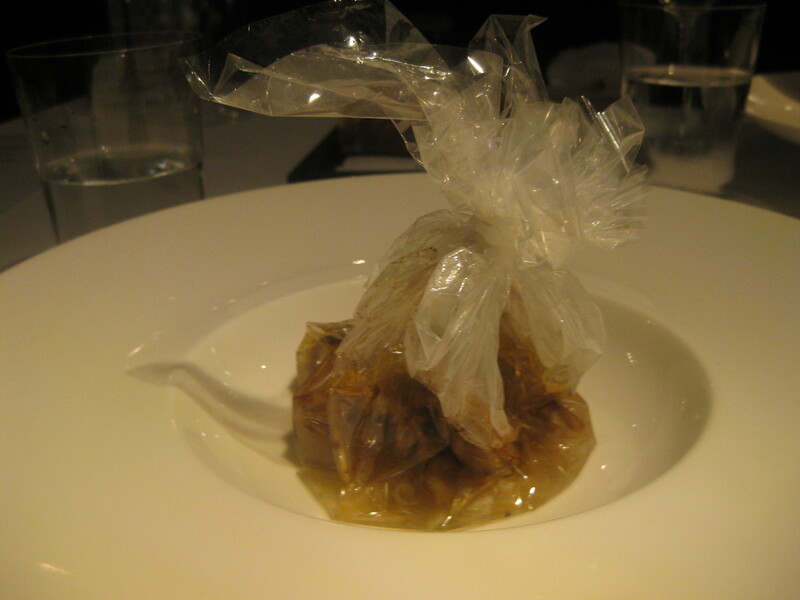 Similar to the cooking process used for the "apple pie" at Aronia de Takazawa, here the bag (specially designed to withstand high temperatures) is used to cook a dish of fish and mushrooms - incredibly clean and simple flavors. Lovely. 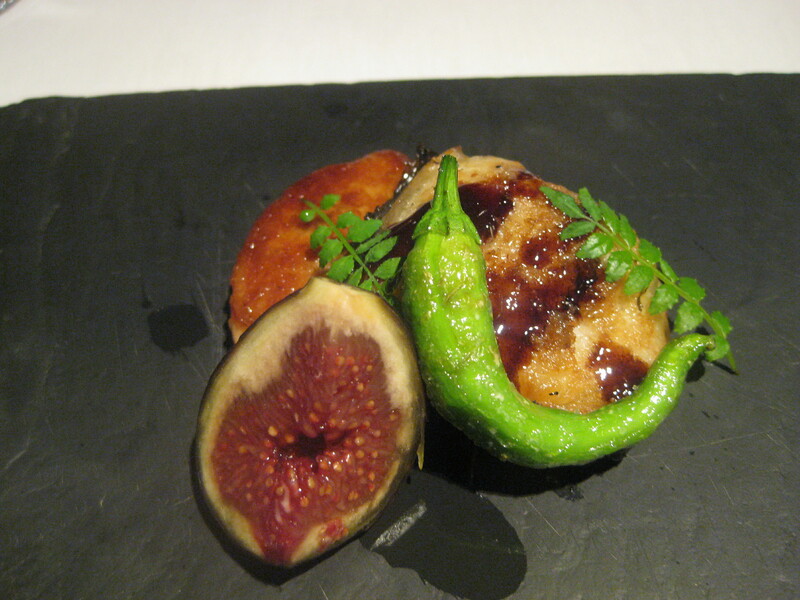 Eel, foie gras, fig, and Spanish pepper, with flavors subtly redolent of the smoked-out presentation. 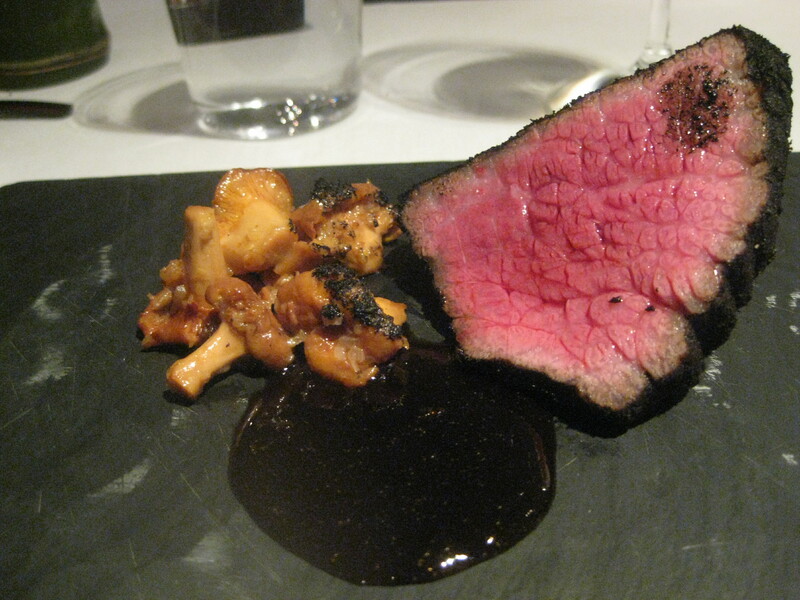 Ozaki Beef with mushrooms. The beef is slow cooked at a surprisingly low temperature and constantly basted with olive oil. 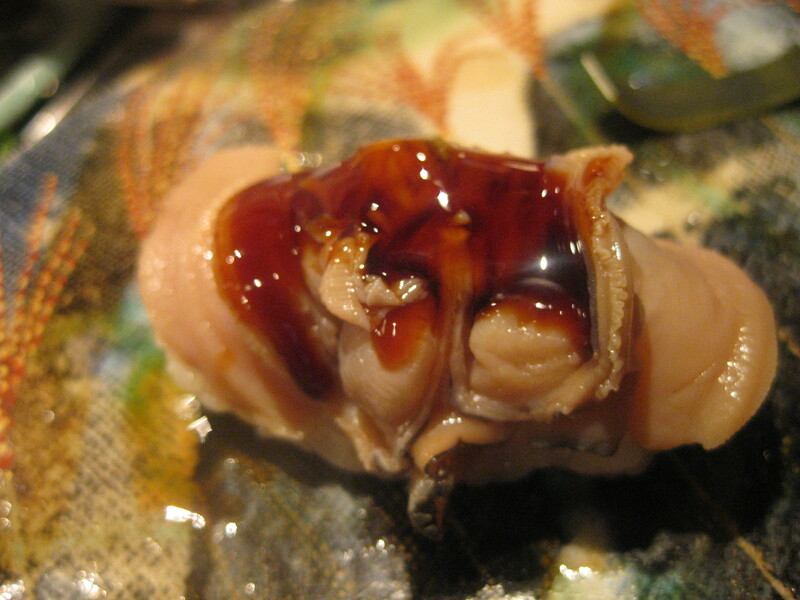 The result = an incredibly tender piece of meat. 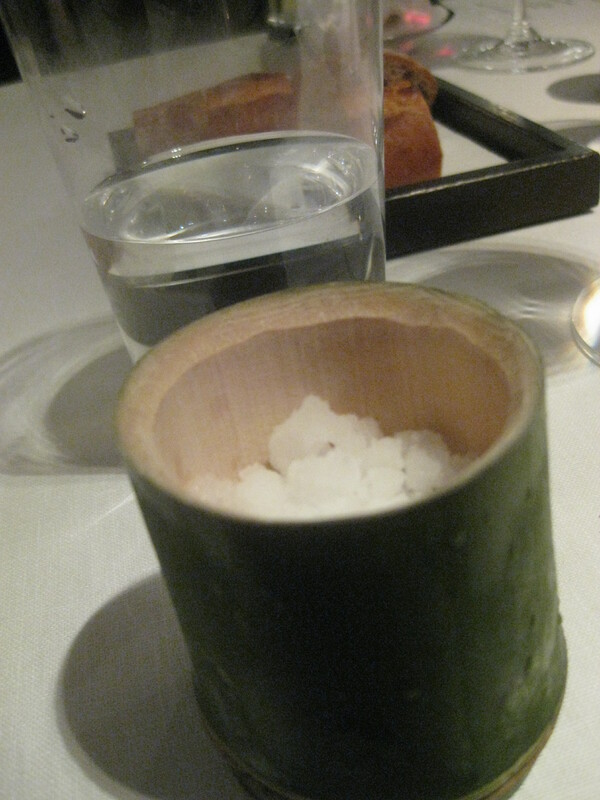 Served with a sake granita. 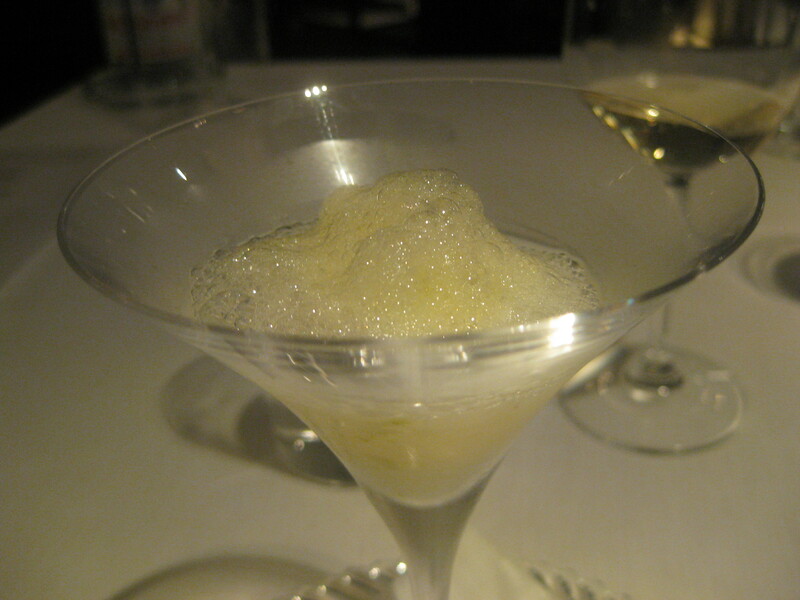 The above, a deceptively simple-looking dish, contained a gel-like globule encapsulating an intense burst of liquid pear. 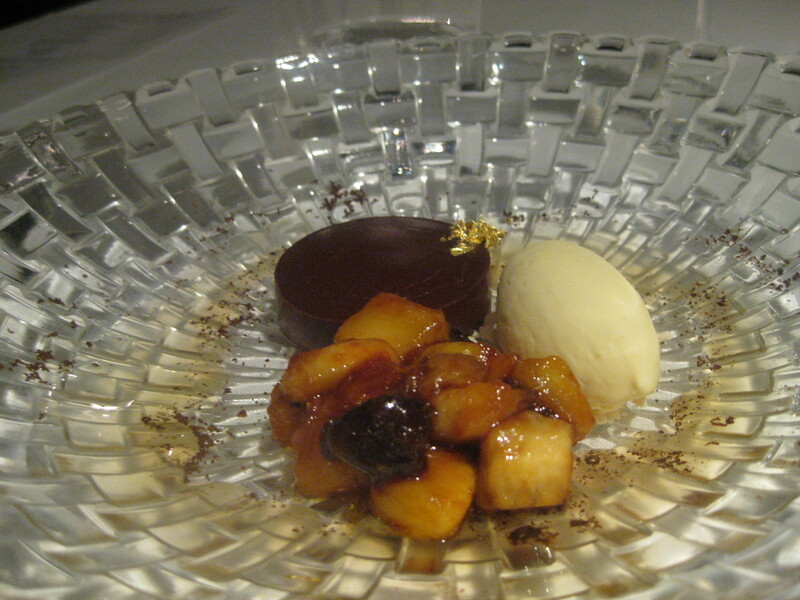 Sinful dark chocolate dessert, caramelized bananas, sugar cane, rum, and ice cream. Which was followed by the dessert tray. 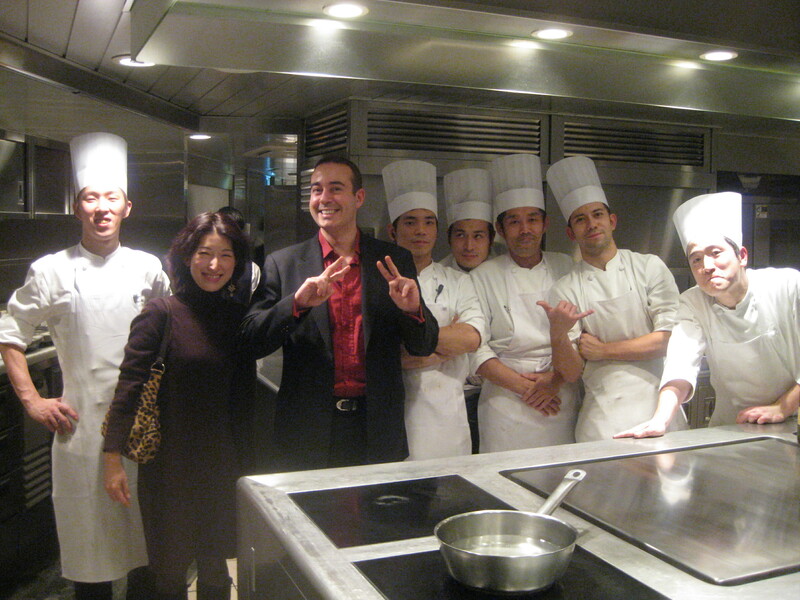 Keiko and I hanging with the kitchen crew. Later that night, we would rumble with the Jets. 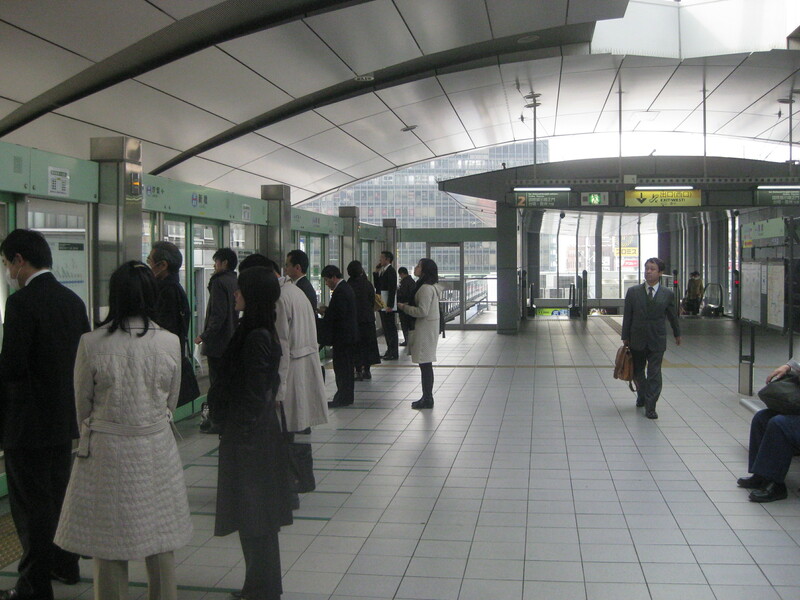 Previous Article November 27, 2009: Toko Travel Day #3 – No Pepsi Cucumber, Coke! Aroma Fresca! A Sneak Peek at Tomorrow’s Gear-eat Entry! 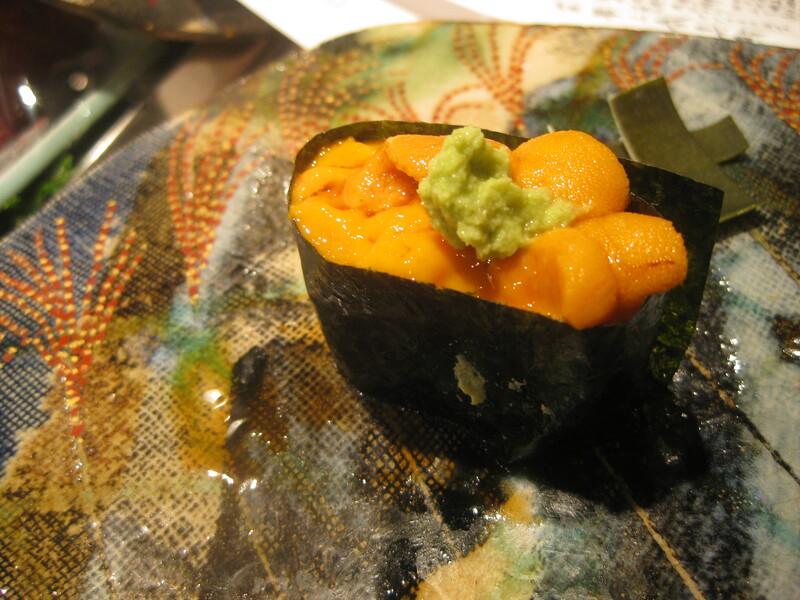 Next Article November 29, 2009: Tokyo Travel Day #5 – Faro, Kadowaki, and the Sights of Ginza! The robots look fun – but, as you say, more of a guy thing. Boys and their toys. The food looks amazing but I don’t think that I would be brave enough to eat some of the offerings. Eel, squid and liver are not on my normal eating list. By the time that you get back to Canada you will be needing a holiday to help you recover from your holiday – or is the word ‘holiday’ a UK word? Vacation! Have a good night’s sleep – if I have worked the time difference out. It is just after 1500 hrs GMT so it will be about mid-night in Japan (I think). 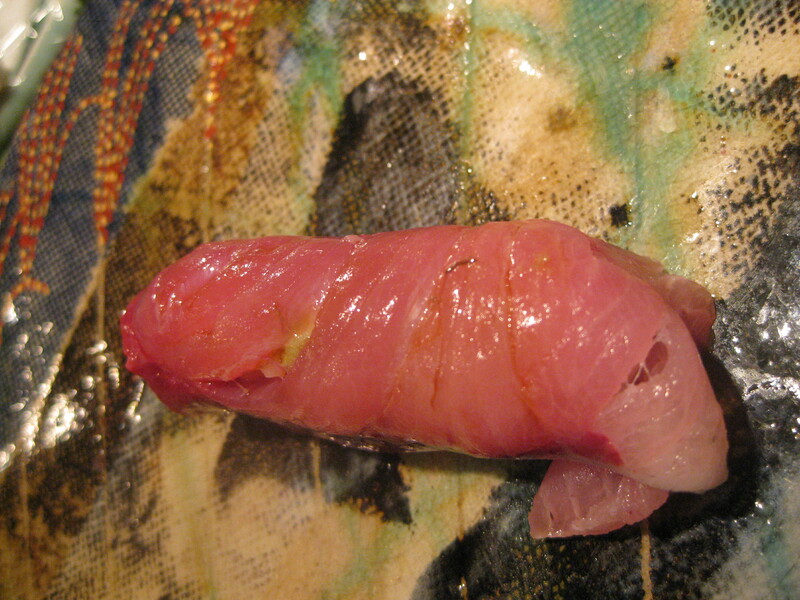 Hey Joe, the thing which you ate next to the squid (ika) is a plaice (karei). Joe, thanks for all the terrific shot and videos today. Hope its not states secrets taking video at the expo. I am glad you have so many friends there to go places with you. 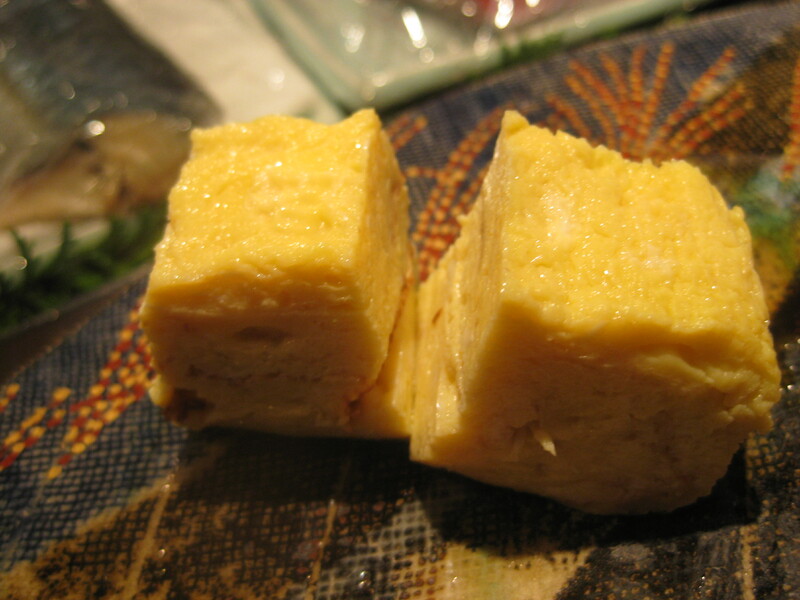 I have to admit I looked up a few of the words today to see what they meant, that tamago sounds very good. Keep sharing and having fun. @crazymom, and @angelus so sorry for your loss, prayers are with you and your families. @das, hope dad gets home soon and feels better. 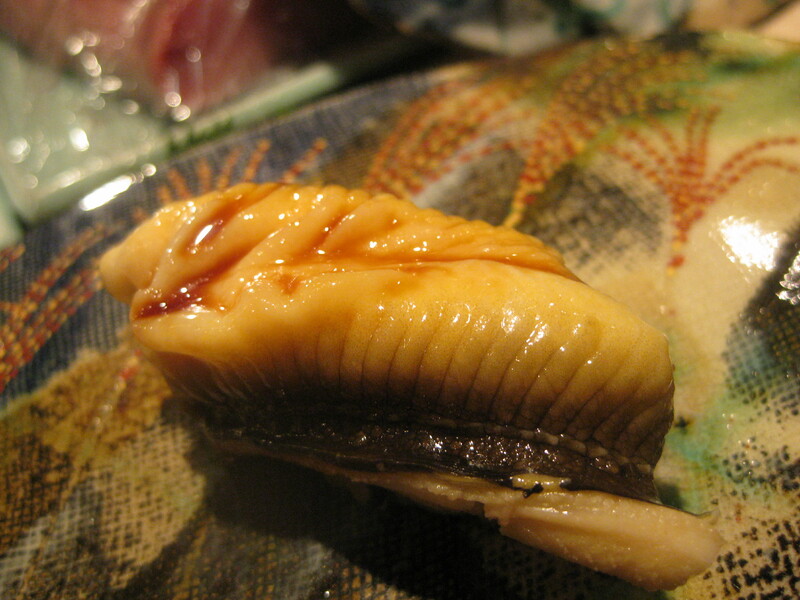 Mmm… ika. I adore squid. Shakey’s ika and corn pizza was excellent, low brow, but yummy. That banana dessert… I am so drooling. I’m now eyeing the roasting bags in the store… I never do beef or turkey in them, but crustless pie is intriguing. Which sends me on a tangent: Have you ever had Engine Stew? You wrap meat and veggies in layers of heavy-duty foil and stuff it in the engine compartment of your car on long roads trips. By the time you stop: stew! Wrap it well and it won’t pick up fuel and oil scents. Today’s entry has left me with a feeling of hunger and foretelling of unemployment. Not to worry though cause I’m going to go dance with my dog. Day four’s post is definitely above and beyond the call of duty. Lots of videos, pics, and descriptions. 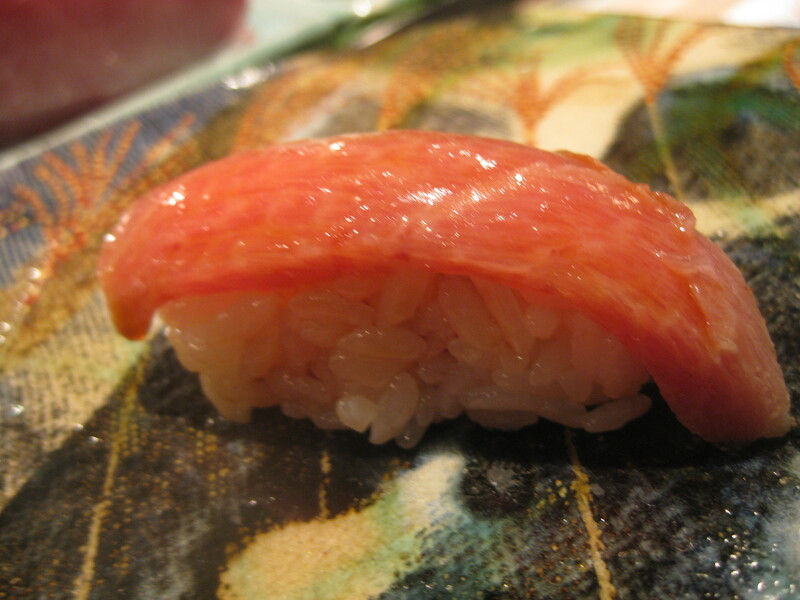 The sushi looks especially delectible. Not sure how I feel about “blasting” a nice piece of meat with olive oil, though low temp cooking can preoduce some nice results. Glad you’er still having fun. Please keep the pics coming. That page turner has some potential for quadriplegics and stair climbers at the gym (not have to touch book with sweaty fingers). It looks like it would only work with THAT book, though. Also, I’ve been known to try to listen to stuff on headphones while I read so the combination of moving, mechanical parts and headphone wires around my head probably wouldn’t end well. The men go for the chocolate in greater numbers? I’ve been in a country where it was an even split and remember noting that the waiter even needed to ask which of us ordered which dessert. We never got that question in the U.S. It’s a given. Cool bots. Shuddering at your tab so far, man. @Crazymom1 and Angelus, so sorry to hear prayers with you both. Holy smokes, Food Man, one of the restaurant rumblers looks like he may have some touch with Hawaii. He shows the Hawaiian “shaka” hand sign. COOL. Another tidbit from the world of Microsoft – specifically Windows 7. One of our LGers, Pooka – with her sharp vision noted that one of the commercials featuring Tyrone who was flown to Texas to check out his new computer – a Dell laptop. As he started to display images on this puter, the camera angle swings to show what Tyrone is watching. Now the Holy Hannah part – you see a sun exploding and Goa’uld ships being destroyed by the sun. Hoo Rah – they had a film clip of…drum roll please, Stargate SG1. Cool! Of course some of us visually challenged needed a little help to pay attention since the clip is brief. Hope you are able to eventually see that commercial. Probably have to wait till you return from Japan. Thanks for all the pictures…more, please. Did you know your dogs are twittering even though you’re in Japan? Are they allowed to do that? Dogs have been known to act up when their owners leave – usually in the form of surprises in their shoes. Watch out. Just in case anyone is interested, here is the link to see the commercial with Stargate SG-1. @crazymom and Angelus: So, so sorry to hear about your losses. May your solace come from heaven. cool. Refuel’s menu is up. Hey Joe! Sound like your having fun in Tokyo! Love the robots. My favorite is the doggie dance troop! Very cute! That page turning thing would good for a pianist. Thanks for the robot videos. Guy thing, my foot. 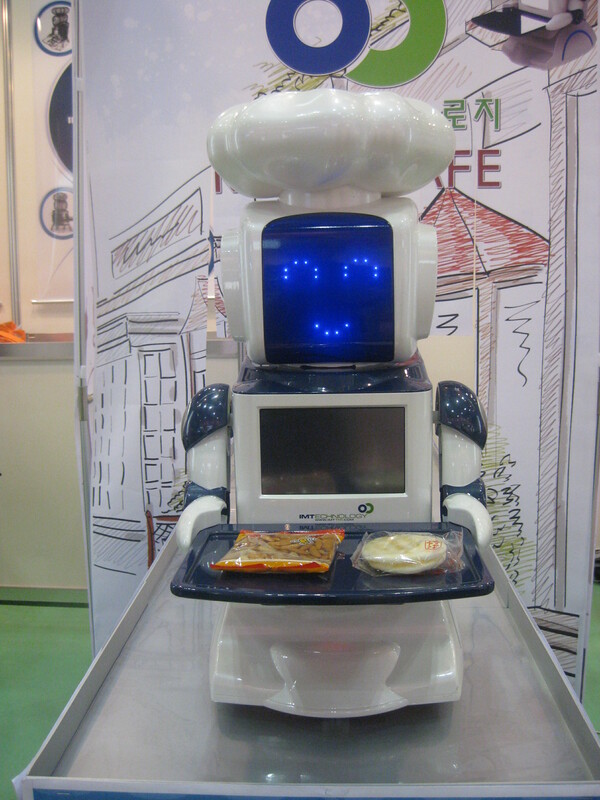 I’m looking forward to having my very own robot to take care of me when I’m too old and frail to take care of myself. 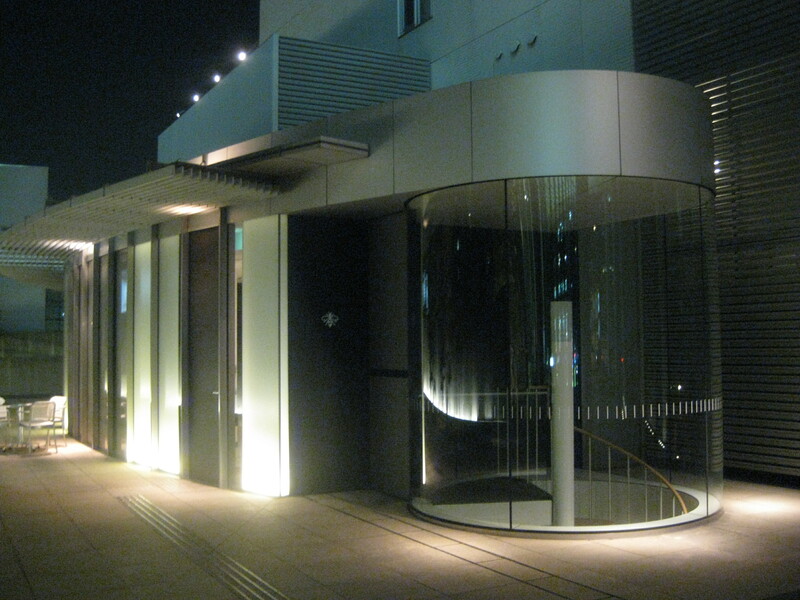 Took a post Holiday jaunt to your site and was so excited to see that you are in Tokyo. I truly love reading about your adventures, looking at pics and viewing odd yet entertaining vids. 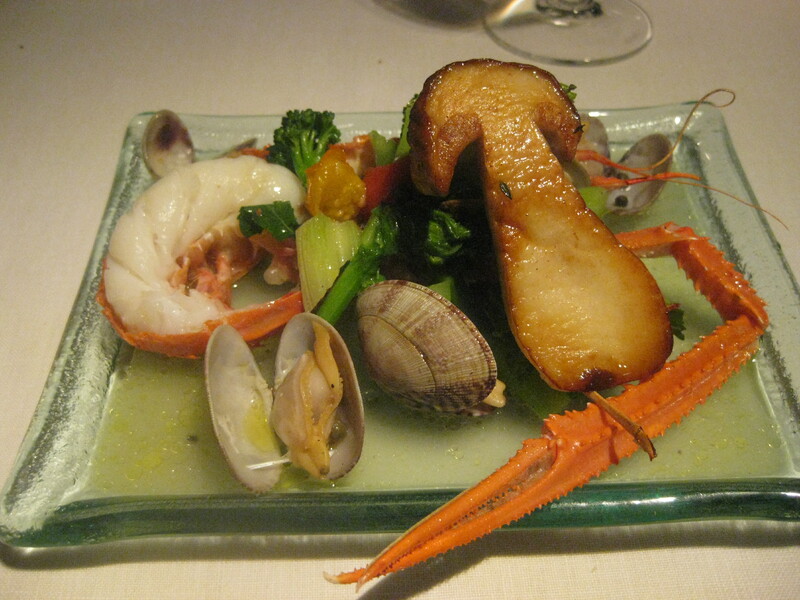 The theatrical presentations at Les Creations de Narisawa were most impressive as well. Tell me though – do you turn the volume down on the videos or is the restaurant really that quiet? Also how much time each day do you spend preparing your post? Not complaining at all – just wondered if you set aside a block of time to get it down or are you inspired each day and go with the flow. Thanks Joe for the videos they were fun. The food looks fantastic. Can’t wait for the next show and tell. Hey I bet you didn’t know that the song playing in the background of the dancing dog video is Korean. Ah, good times. Lovely food and lovely company. Also kudos, you’re really good at writing these travel diaries. But now be honest: exactly when did you start missing the pugs? 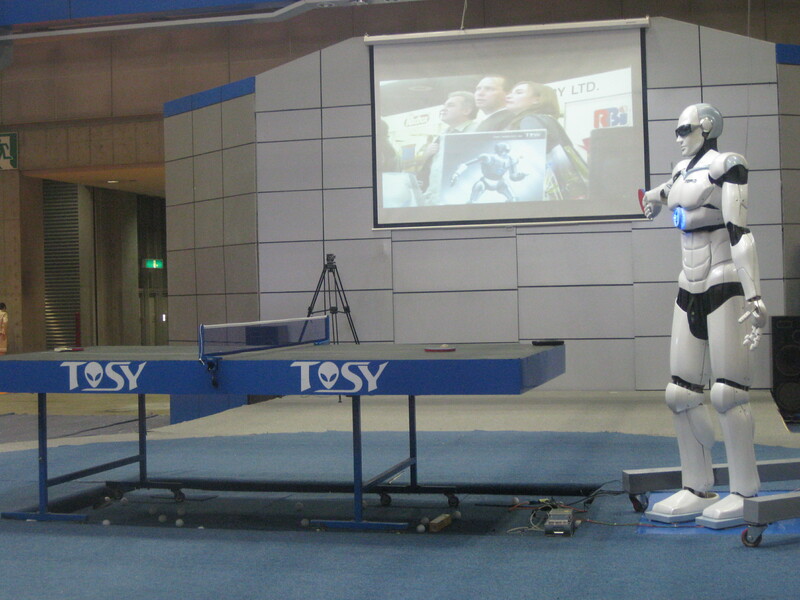 Looks like a good time in Tokyo, would have liked to see a video of the tall robot with the ping pong. I’m also noticing the show is beginning to build up on top of previous episodes, and i think the second half of the season will be much more invigorating. Love the videos, Joe, thanks. 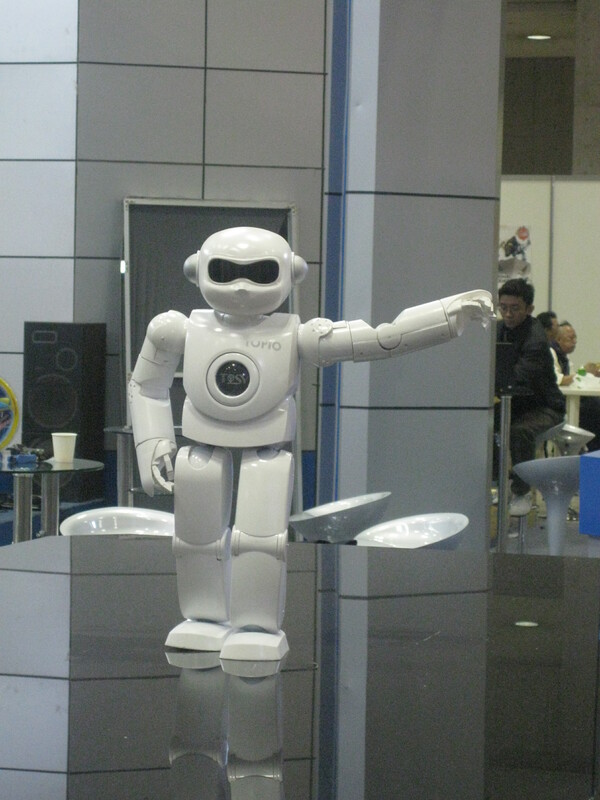 The robot exhibition looked like fun. I could have gotten lost in there for hours. Have you spotted anything that qualifies for the W-F-P-O-T-D? my brother says that the cucuber pepsi & green tea coke (as well as other odd soft drinks) should be available at any grocery or convenience store over there. but his source is 2 years old. if it turns out that he’s sent you chacing wild geese, i’ll mock him over it. not that i need an excuse to mock him. Good morning Joe! Wow, another humongous post! I may need a Glossary of Terms before your trip is over. Are there any “Mom and Pop” type diners there? (or mama-san and papa-san) I’m wondering what kind of food they serve. Looking forward to your next entry.